Word up, peeps! I’m serving up a couple of short-term chart patterns in today’s intraday charts update, namely a channel on GBP/CHF and a triangle on EUR/AUD. Check ’em out! EUR/AUD has been trending higher for a while but it recently began trading sideways after hitting resistance at 1.6170. The pair’s price action does appear to be tapering, though. And if we connect the most recent peaks and troughs, we can see that a symmetrical triangle appears to be forming. 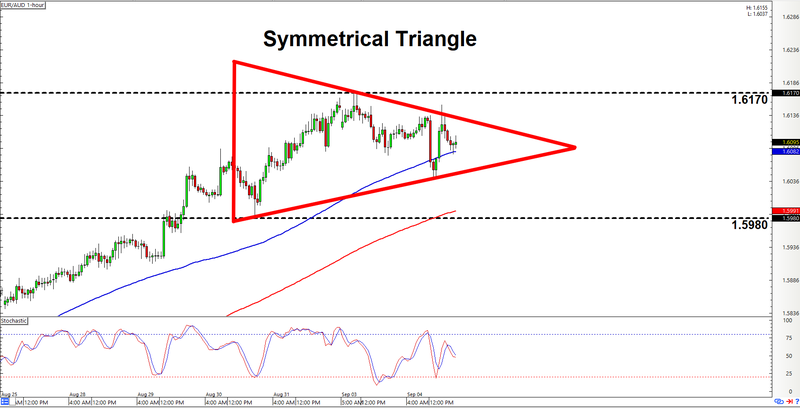 A symmetrical triangle pattern means that bulls and bears are fighting it out but neither side has a winning edge … for now. It’s only a matter of time before one side finally give way, though. With that said, a topside breakout is just as likely to happen as a downside triangle break. We therefore don’t really have a strong directional bias on the pair. It would even be prudent for y’all to prepare for both topside and downside scenarios. In any case, a topside breakout needs to clear 1.6170 in order to confirm the breakout. A downside breakout, meanwhile, should ideally smash lower past 1.5980 on strong bearish momentum. 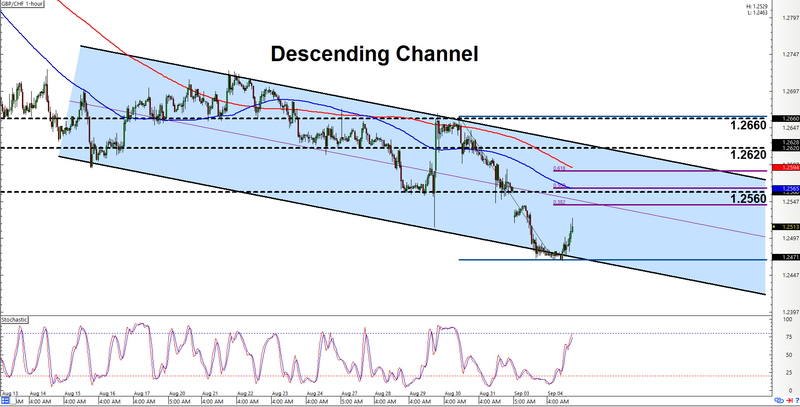 If trading trends is more your thing, then you may like that there descending channel on GBP/CHF’s 1-hour chart. As y’all can see, the pair is currently moving back up again after testing the channel’s support area. Y’all may therefore wanna put this pair on yo watchlist since an opportunity to go short may present itself soon. The standard (and most conservative) way to play this descending channel is to wait for the pair to test the channel’s resistance, which should be at or just below the area of interest at 1.2620. However, there’s also a risk that the pair may find resistance well before 1.2620 since there’s also an area of interest at 1.2560. Moreover, 1.2560 happens to line up rather nicely with the 50% Fibonacci retracement level. Whichever scenario plays out, y’all just make sure to practice proper risk management as always, a’ight? And as always, do keep in mind that there’s always a chance that the setup may fail. In this case, a move higher past 1.2660 would signal a valid topside channel breakout. If that happens, then y’all may wanna think about bailing yo shorts or even switching to a more bullish bias on the pair.